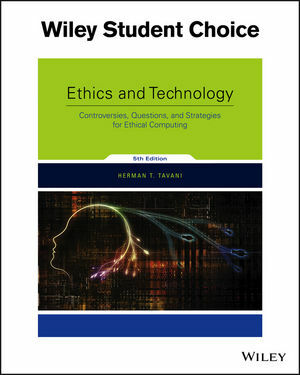 Ethics and Technology, 5th Edition, by Herman Tavani introduces students to issues and controversies that comprise the relatively new field of cyberethics. This text examines a wide range of cyberethics issues--from specific issues of moral responsibility that directly affect computer and information technology (IT) professionals to broader social and ethical concerns that affect each of us in our day-to-day lives. The 5th edition shows how modern day controversies created by emerging technologies can be analyzed from the perspective of standard ethical concepts and theories. • New Learning objectives highlighted at the beginning of each chapter. • New Beginning-of-chapter scenarios are designed to capture one or more of the key themes/issues/controversies comprising that chapter. • New or updated in-chapter scenarios illustrating both actual cases and hypothetical situations. • New sample arguments in many chapters, which enable students to apply the tools for argument analysis covered in Chapter 3. • New and revised end-of-chapter “Scenarios for Analysis,” provide students and instructors with additional resources for analyzing important controversies. These can be used for either in-class analysis and group projects or outside-class assignments. • New and revised review and discussion questions at the end of each chapter. o State-sponsored cyberattacks and their implications for (inter)national security. o Whistle-blowing controversies generated by the leaking of highly sensitive (governmental) information in digital form. o NSA-surveillance-related leaks and their implications for both personal privacy and national security. o Privacy threats posed by Big Data. o Challenges posed to the recording industry/artists by the online services that stream digital music. • Comprehensive and Up-to-Date. Covers all of the standard topics such as codes of conduct, privacy, security, crime, intellectual property, and free speech, and also discusses sometimes overlooked subjects such as democracy, employment, access, and the digital divide. • Diverse Points of View. Approaches the subject matter of cyberethics from diverse points of view. The author examines issues from a social science perspective, from a philosophical perspective, and from a computing professional perspective, and then he suggests ways to integrate these diverse approaches. • Critical Thinking Skills. Contains an entire chapter discussing critical thinking skills and is filled with review and discussion questions.